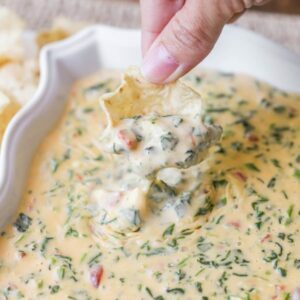 Cheesy Spinach and Bacon Dip - one of the easiest and most delicious dips you'll ever make! All it takes is cream cheese, Velveeta, spinach, diced tomatoes, and bacon!! Combine all ingredients in a glass bowl and microwave on HIGH for 5 minutes or until everything is completely melted. Stir until well blended. Serve immediately with chips or crackers. ENJOY!